I finished this table runner today. 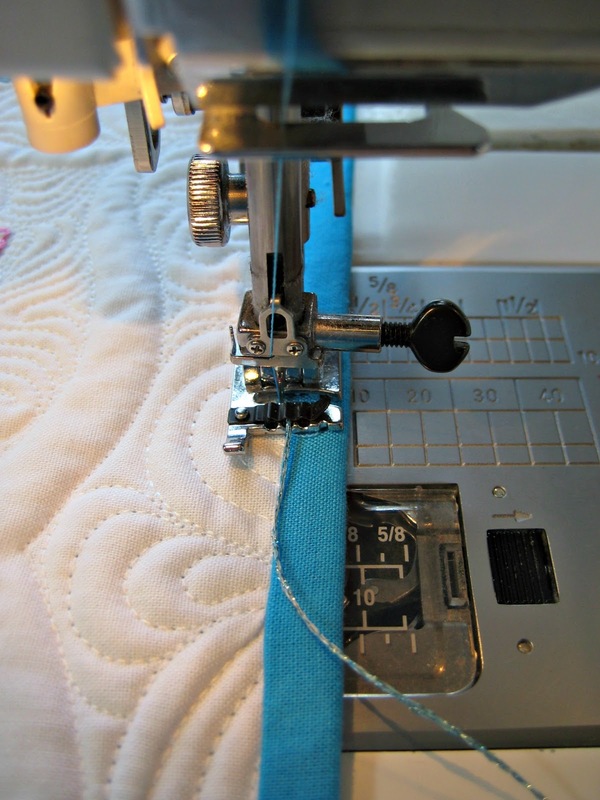 I used a Janome MC15000, at Sew Simple where I work, to embroider the blocks. 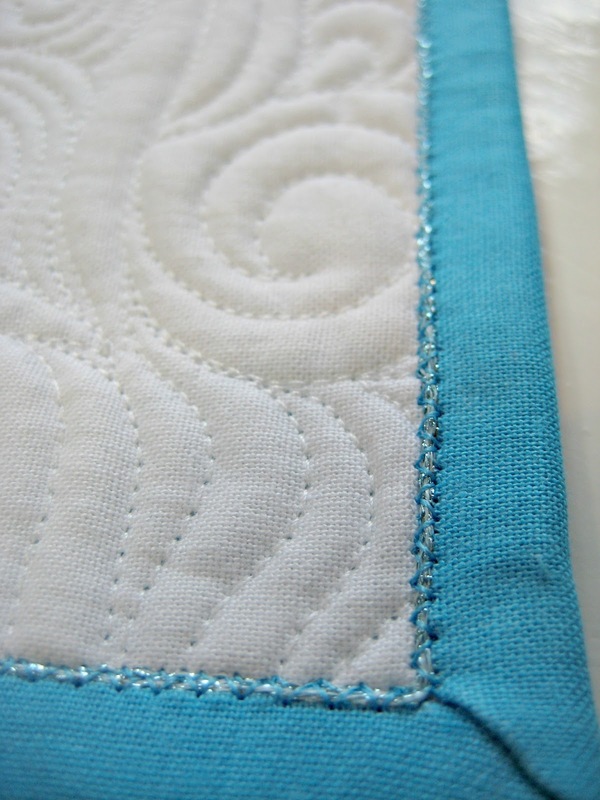 The blocks themselves are all the same embroidery design done four times around a center point. This was pretty easy and fun to do. Only the embroidery was done on the 15000, everything else was done on my Janome 6600P. I thought the embroidery needed a frame around it and I needed to free motion quilt between the individual motifs that made up each block. 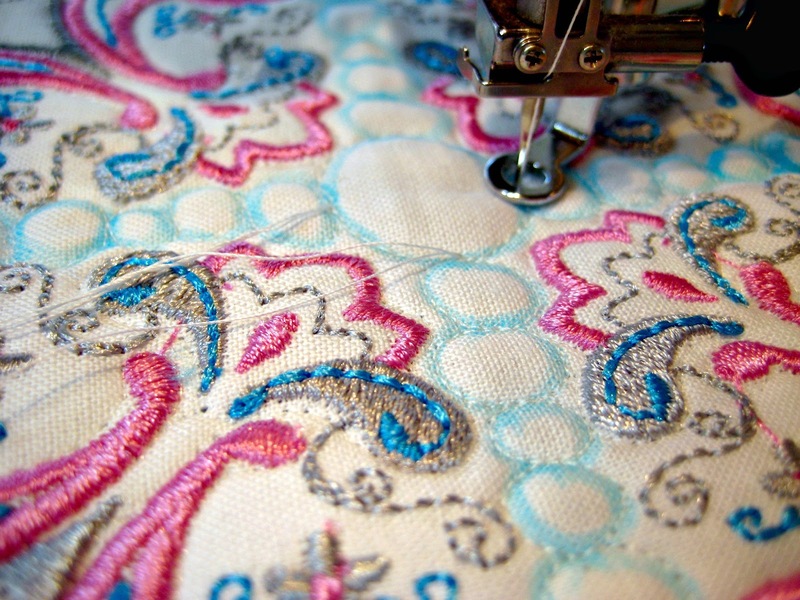 I had already quilted around the embroidery. So out came my trusty Mark B Gone pen. The area between blocks was very tiny, but something needed to be quilted in there. A design bases on circles fitted just right and was easy to draw using the embroidery as a guideline. I've never had issues with the blue pen as long as I soak the piece to remove it. Spraying with water can sometimes do the trick, but it tends to reappear on the bottom of the piece. There are a few eraser products for this marker that work great too. I am always careful to not iron over the marks. My favorite is the air erasable pen, but I knew I needed more time before my marks disappeared. My go-to marking pen (Dritz Dual Purpose Marking Pen) actually has both of these markers together. All done and bound. I chose to finish the binding by machine and zig zagged some Superior Thread's Razzle Dazzle along the edge of the binding to secure it. The back of a well-quilted piece is always fabulous. Even though I used white thread top and bottom, it still looks good on the back. I wished I had used a light turquoise thread though. But I did stitch with my Aurifil again and I think it's now my favorite cotton thread. 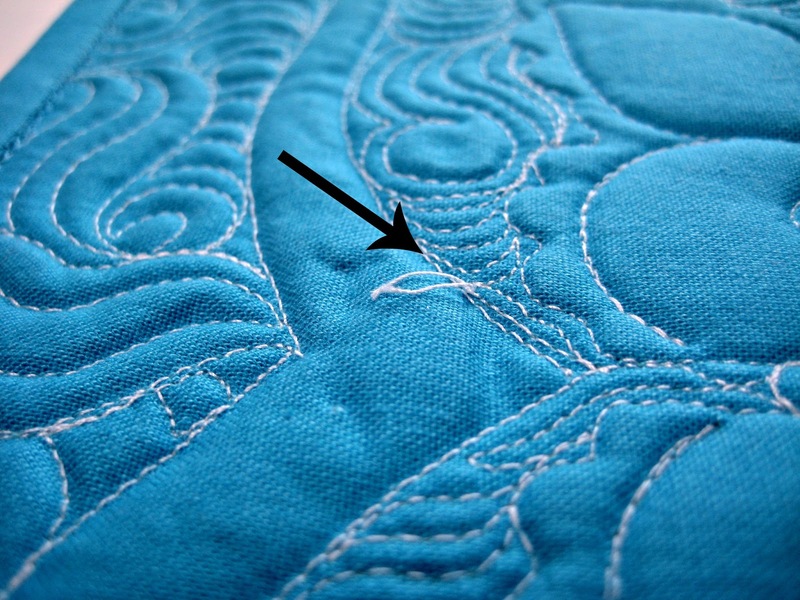 A detail shot of the back to show what happens when you use your machine's automatic thread cutter function. Half inch thread tails are left. This wasn't an issue with this piece since there were just a few to trim, but I wouldn't want to do this for a large quilt and then go hunting little thread tails to trim. But using the cutter does save me some time, so I use it sometimes. Here I am using my machine's H foot to couch this sparkly thread. Worked great! See that there's no pins holding the binding in place? Glue. Yep. If it's good enough for Sharon Schamber, it certainly good enough for me. I use Roxanne Glue Baste It . I bought it for the applicator with the intent to use it for my Elmer's washable glue, but I figure I might as well use Roxanne's up first. Love using this product! The trick is to press the area being glued with a hot iron and it dries in a second. It holds securely, but it can be 'popped' loose if you need to re-position it or to open a glued seam. Washes right out too. This is the first time I used couching in conjunction with stitching a binding down. I think I like it. Tomorrow I go to work in the shop and I'm looking forward to displaying this somewhere there. Have you used any of these products or techniques in your work? Share in the comments. Beautiful job. 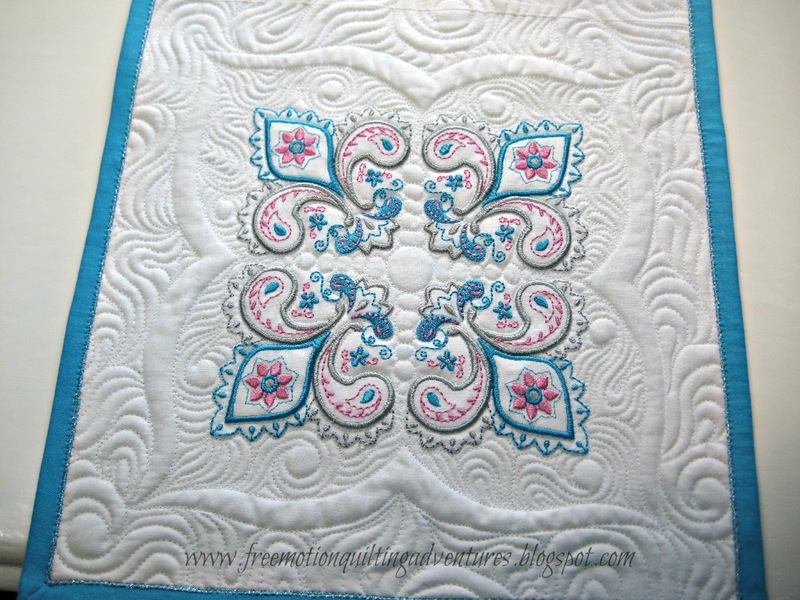 Love the combination of machine embroidery and free motion quilting. Oh that is beautiful, Amy. Congrats!! That looks absolutely fabulous Amy! I'd never seen the couching to hold the binding down before. That is really lovely, Amy! This is a lovely piece, and has inspired me to make a couple of bed runners using my embroidery machine then quilt in this way afterwards. Fabulous! Yay! 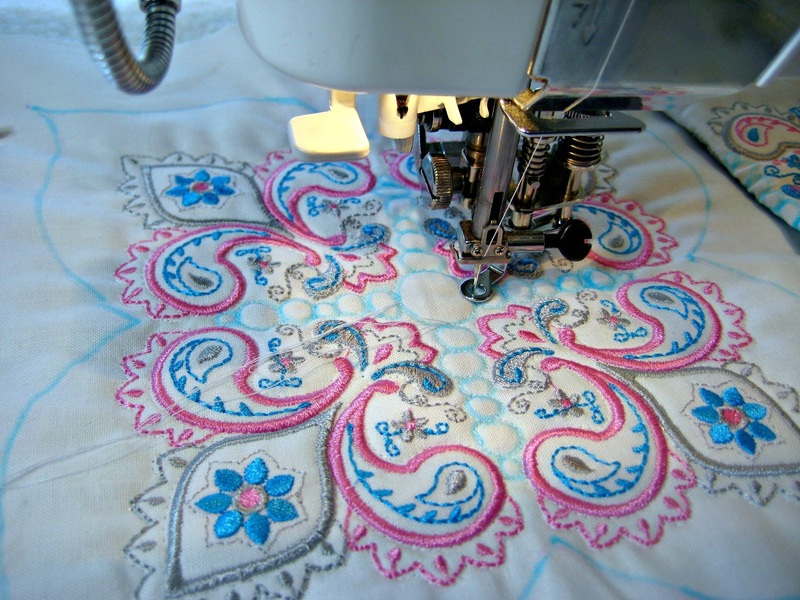 It's great to really use these wonderful embroidery machines in more projects. I might have to invest in one. 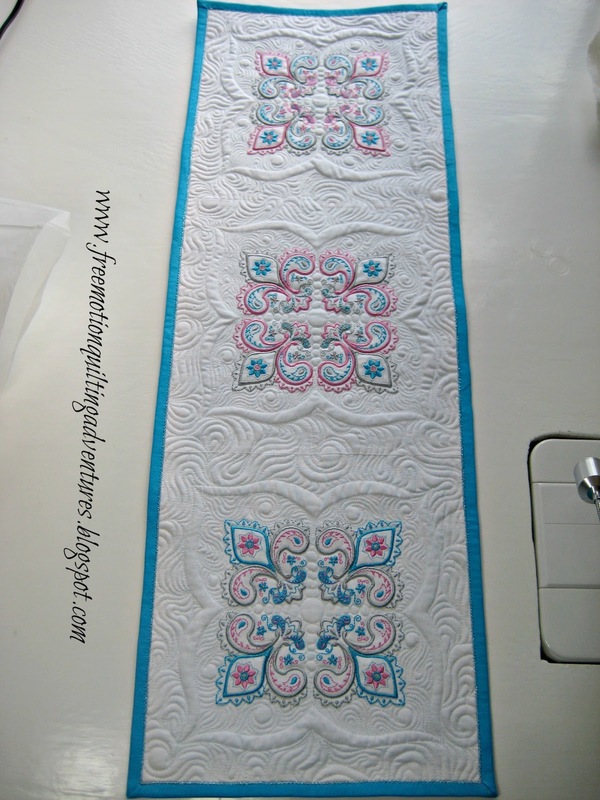 What a stunning table runner. 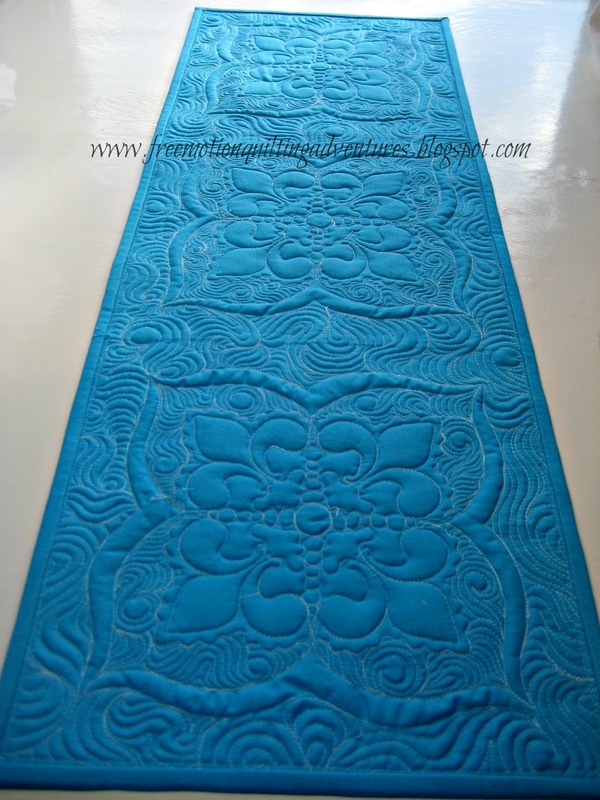 Your choice is quilting is perfect! that is beautiful! love the couching on the binding, too. Love your comments on pens. I have used Sharon's tutorial on glue basting the binding and I love it. I always glue down my binding a la Sharon's method, much better than using clip. Will have to try the couching on the binding, looks great. Fabulous, Amy and so instructive too on how you do things. That can easily be used front and back. Thanks for sharing. It really is beautiful and no I haven't tried gluing down my bindings yet. I love how this came out-really beautiful job!